Field and Safety Orange Cones Made of Durable Hard Plastic. FREE shipping in the contiguous USA! Bright, fluorescent, orange plastic safety cones have dozens of uses from obstacle courses to relay goals. 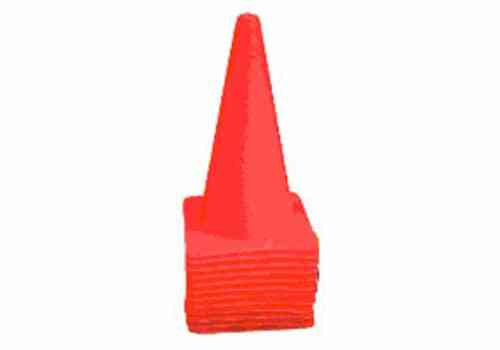 Set of 12 orange cones. Perfect for use with kids or sports. Made of hard plastic and not intended for street and highway use. Bright, fluorescent, orange plastic safety cones have dozens of uses from obstacle courses to relay goals. Sets of 12 orange cones. Perfect for use with kids or sports. Made of hard plastic and not intended for street and highway use. Note: Color may fade with continuous, long-term exposure to sunlight (i.e. permanently left outside).